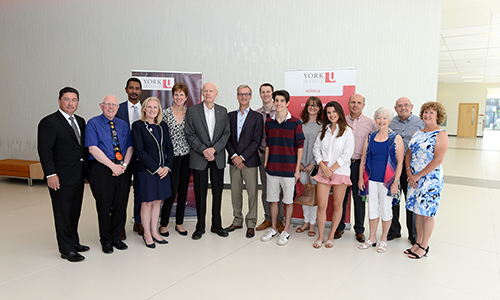 Thanks to a $1.5 M gift from the Carswell Family Foundation, matched by York University for a total of $3 M, the Faculty of Science has created a new Carswell Chair for the Public Understanding of Astronomy. Congratulations to Paul Delaney (Physics & Astronomy) for being appointed as the inaugural Chair holder. 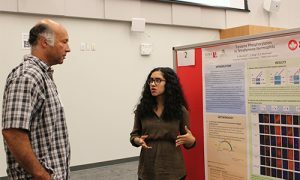 More than 50 students participated in the 2018 Faculty of Science Summer Undergraduate Research Conference on Aug. 7. Congratulations to all of the participants and award winners. The Faculty announced the recruitment of three new science communicators in residence for 2018-19: Molly Segal, BD Colen and Dan Falk. Read the announcement in yFile. Alumnus Paul Sanberg received the York Bryden Alumni Award for Outstanding Contribution. 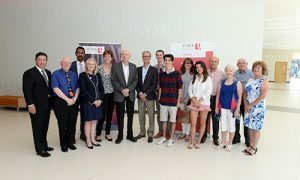 Patrick Hall (Physics & Astronomy) was awarded a $25,000 NSERC Engage grant to work with Medical Confidence, a company in the GTA, to use astrophysical computing experience to incorporate an Analytical Business Intelligence module into their healthcare navigation service. Hélène Mialet (Science & Technology Studies) published “Anthropologie numérique ou anthropologie de la trace” in: Bernard Stiegler, ed., La Vérité du numérique: Recherche et enseignement supérieur à l’ère des technologies numériques (Paris: FYP éditions, 2018) 189-203. Amro Zayed (Biology) and his team published Conservation Genomics of the Declining North American Bumblebee Bombus terricola Reveals Inbreeding and Selection on Immune Genes in Frontiers in Genetics. Marshall McCall (Physics & Astronomy) joined a ParkBus excursion to Sibbald Point Provincial Park on August 12 to elaborate on the Perseid meteor shower that everyone had come to observe and some of the other sights of the night sky. Drylands including deserts and semi-arid grasslands are challenging ecosystems. Drought, groundwater depletion, agriculture, and energy development initiatives are major issues. Christopher Lortie (Biology) and collaborators at The Nature Conservancy used scientific synthesis in the form of a systematic review to examine the extent that evidence can inform decisions for retiring lands in California. That found that retiring lands has value, and with some simple rules-of-thumb backed by evidence, there is an opportunity to protect and develop habitat for species in drylands. Amro Zayed (Biology) spoke to Reuters about new research conducted by his team that found that inbreeding and disease may be causing the decline of yellow-banded bumble bees. Paul Delaney (Physics & Astronomy) spoke to CTV News, AM640, CJAD and CHML about the Parker Solar Probe launch, as well as other topics including the Hayabusa2 spacecraft, exoplanet Kelt-9b, observing Mars, ISS air leak, gravity waves and Earth’s possible destruction. Derek Wilson (Chemistry) and lab manager Cristina Lento published Advanced bioanalytical technologies accelerate drug development in the new age of protein therapeutics in Laboratory Focus.